The answer is, “Goodreads is good for creating interest around everything that has to do with books”. As a reader, a writer, or a reviewer you can lose yourself in Goodreads if you plow through the horrible interface and abandon yourself to it. I’ve been a member since January, 2012 and I’ve only skimmed the surface. 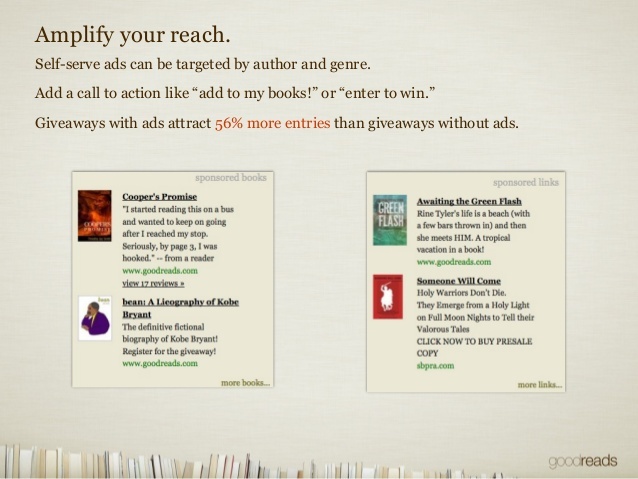 But one feature (besides ads) that I’ve benefited from over time is the Goodreads giveaways feature. After running a number of Goodreads giveaways I want to help dispel any confusion about why or when to run them (I’ll do ‘how’ in another post). As an author I’ve had hundreds of people add my books to their shelves using contests. It’s worth every minute I’ve invested. 1) What are the Goodreads giveaways good for? Simple. They get your book in front of hundreds, or even thousands of people. And not just any people, READING PEOPLE. Our favorite people. When a reader enters the contest they are opted-in to add your book to their Goodreads shelves. That means most entrants will have your book added when they enter. So what? you may ask. The big deal here is that if your book is not released yet then everyone who added the book to their shelves will receive an email when your book arrives! Let me repeat that, if you are promoting a book by doing a giveaway on Goodreads, and the book is pre-release, everyone who adds your book to their shelves while entering your contest will receive a launch email from Goodreads. 2) Can I run a contest for a book that I’ve already released? Yup, and it will definitely help you get exposure, too. The downside is that there will be no launch email sent out by Goodreads since your book is already out there. But you will get on a bunch of shelves and you’ll be able to get reviews, plus some new friends to follow your Goodreads status and event updates. 3) How can I maximize success? Two things, run the contest for one month. This gives it time to find traction. Two, advertise the giveaway on Goodreads. This will give you the best chance to find people who are interested in books like yours. If you’re doing a giveaway for a pre-release, then do your first contest 3-5 months before launch to build buzz. You’ll need to give away proofs, because, well the book isn’t out yet! Also important to note, you cannot give away ebooks at this time. I hope this clears up any confusion about what Goodreads giveaways are good for. Did I do a good job of that? Let me know in the comments! Don’t miss this priceless slide show presentation that Goodreads gave recently about how to promote your books on Goodreads! 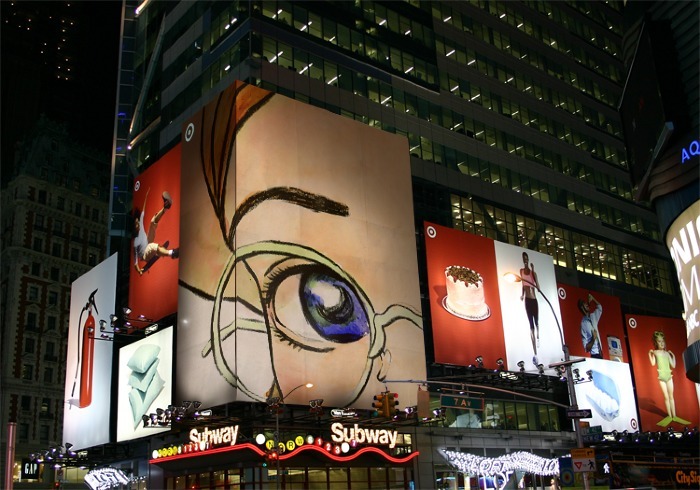 Does advertising on Goodreads work? Let me know your thoughts, and your own experiences in the comments! Goodreads is a tough nut to crack, but we can do it together. Excellent article. I have been considering doing this for a while, but wasn’t quite sure how useful it would be. After reading your article, I shall certainly be hooking up a giveaway for all three of my books! Thanks John! Good decision. Goodreads is worth the time to figure out. Somewhere in the Goodreads+Amazon brew there’ll be some incredible opportunities. I think contests are likely the cornerstone opportunity. Thank you for this article. I have not given thought to contests before. Will definitely look into the idea now. I’m so glad it was helpful! Contests, when leveraged wisely, are a great way to be seen. Hi, This is very helpful article, I have a question, of you would like to answer, my book is getting launched in 6 days, do you think give away contest would help? is there any other way i can approach it? If you can help me reach more people:). thank you of your time in advance. It’s a good way to get automatically listed on all the contest sites that comb the Amazon Giveaway tweets for deals. Yes, you’re giving stuff away but only readers like to win books, so you’ll be attracting the right kind of audience.